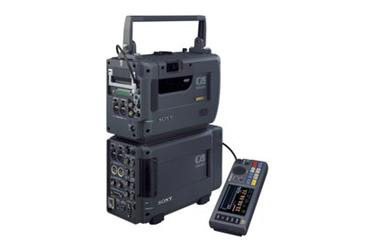 The SRPC-1 HD Video Processor and SRW-1 HD Portable Digital Video Recorder are the newest members of the CineAlta product lineup and form the first Sony full-bandwidth 4:4:4 (RGB) portable VTR system adopting the HDCAM-SR format. The SRW-1/SRPC-1 offers virtually lossless 1080-line high-definition recordings at multiple frame rates on the HDCAM-SR tape media. The SRW-1/SRPC-1 connects to its companion HDCF950 portable camera via a single optical fiber cable to create a convenient, portable full-bandwidth 4:4:4 (RGB) image capturing system. The SRW-1 can be configured with the HDWF900 HDCAM camcorder to record HD 4:2:2 component images. The SRPC-1 processor unit provides a variety of video-processing functions and houses an array of input and output connectors, including HD/SD signals, 12 channels of digital audio, and 4 channels of analog audio. The processing functions include the easy handling of 2-3 pull-down insertions, down conversion, and RGB 4:4:4 to Y/Pb/Pr 4:2:2 color space conversion. High Quality HD Field Recording When connected to its companion HDCF950 camera, the SRW-1/SRPC-1 creates a high quality portable HD image-capturing system. With full-bandwidth RGB 4:4:4 and top-quality 4:2:2 Y/Pb/Pr 10-bit recording capabilities, unprecedented picture quality meets the needs of the most demanding applications in movie-making, commercial production, high end television production and digital-content mastering. Double-Speed Recording The SRW-1/SRPC-1 is equipped with a unique double-speed recording capability, which doubles the drum rotation and tape speed and therefore achieves a data transfer rate of 880 Mbps. Multi Frame-Rate 1080 HD Recording and Playback The SRW-1/SRPC-1 supports both multi frame rate recording and playback using 1920 (H) x 1080 (V) active pixels. 720P Recording and Playback In standard configuration, the SRW-1 can record in 4:2:2 720/59.94P format. Long Recording Time The SRW-1/SRPC-1 is capable of recording up to 50 minutes at 1080/23.98P and up to 40 minutes at 1080/59.94i or 720/59.94P on a single S-sized HDCAM-SR cassette. For even longer recording time, two SRW-1/SRPC-1 units can be cascaded to double the recording capacity. Single Fiber Connection Due to the implementation of an all-digital transmission system incorporating the latest optical technology, the cable connections of the SRW-1/SRPC-1 remain simple and clean. The single-cable transmission system carries all required lossless RGB signals from the HDC-F950 camera to the SRPC-1 Processor and then records them to the docked SRW-1 VTR. RS-422 Interface The RS-422 Sony 9 pin interface allows editors to control the SRW-1/SRP-1 remotely. Connecting to the server via an HD-SDI dual-link connection, the SRW-1/SRPC-1 acts as an on-line feeder, smoothly transferring the recorded material to the post production operation. Detachable Control Panel A detachable control panel provides operators with a comfortable VTR operating environment. Built-in Tele-File Read/Write Capability The SRW-1/SRPC-1 has a built-in Tele-File feature to allow auxiliary information to be stored on a tape label containing an IC chip. Internal Format-Conversion Capability In addition to RGB 4:4:4 and Y/Pb/Pr 4:2:2 conversion, the SRW-1/SRPC-1 possesses a wide variety of format-conversion capabilities ranging from HD to HD and HD to SD.